Yet another bombshell has landed in the NAB 2016 battleground. This time, it’s Canon who has struck with a brand new product in a whole new segment, perhaps only tapped otherwise by Sony – The 18-80mm T4.4 Compact Servo Zoom Lens which features a truly hybrid stills/motion design approach with some interesting cross-breed features. Let’s start with the spec sheet. That’s why you’re all here, right? From Canon’s brochure: Designed to shoot video, this lens can be ideal for the cinematographer moving up from our EF lenses, combining the functionality of our EF lenses with the 4K optical performance, usability and video shooting features of our Cinema lenses. Acknowledging the need to control zoom, focus and iris/aperture, Canon has developed this zoom lens with full external servo control, and an optional ZSG-C10 grip designed exclusively for this lens makes it easier to operate the lens, helping to support a wider range of shooting styles such as shoulder mount ENG style. I’ll skip the rest of the junk that you can read in the brochure… Here’s my take; The lens is certainly full-featured and appears to be very well thought out. I haven’t had the lens on my test bench yet to evaluate for image quality, but at T4.4, I don’t expect too many flaws to show up. Let’s look at some Pros and Cons as I see it. Keep in mind, I come from the world of feature films and this is just my opinion. The nature of the motion picture industry is not as black and white as it used to be and manufacturers are looking to please a much broader market than ever. After all, everyone’s a critic. Right? That said, all of these “misses” are not oversights, but compromises. As I’ve said many, many times: lenses are governed by compromise. Every negative mark I give the new 18-80mm Compact Servo is a usability gain and a cost savings – which brings us to quite possibly the most interesting fact of the new zoom; the price tag. MSRP: $5,500 for the lens and an additional $499 for the Servo Grip Unit w/ Support Post. That’s $6,000 MSRP for the whole package. Alright, so you want a faster T-stop or a more robust housing… You’ll have to fork over 4.5x the amount for an Arri Alura 18-80mm T2.6 or a staggering 14.5x the price for a Fujinon 18-85mm T2.0. You see where I’m going here? At this price, it’s a breakthrough in features that have otherwise been cobbled together or re-purposed when attempted by other manufacturers. 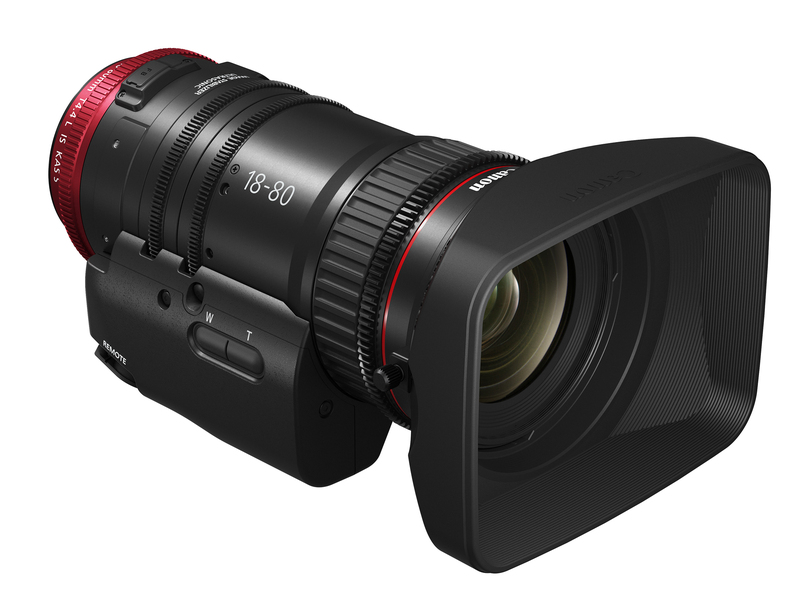 Canon’s new 18-80mm Compact Servo is a lightweight, compact servo lens at a very affordable price point. 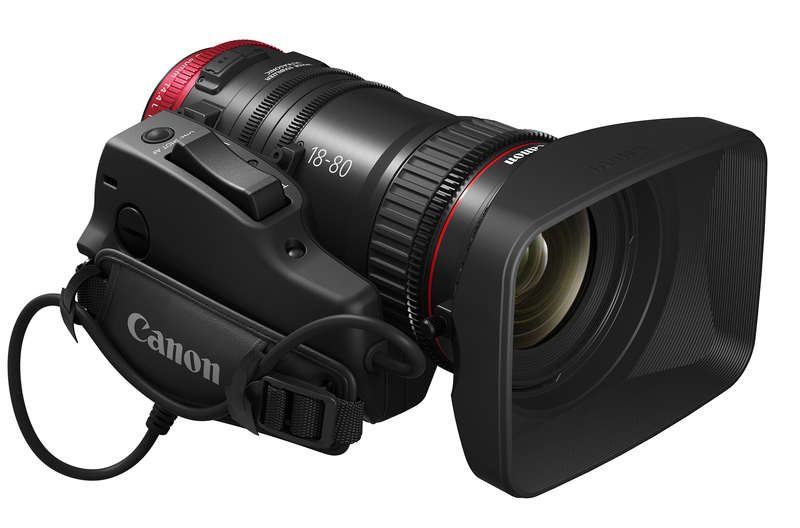 In terms of “look”, Canon says the new Compact Servo will pair nicely with the entire line of Canon Cinema Eos lenses. We don’t have an official release date just yet, but be sure to check back this weekend when we get our hands on the new 18-80mm Canon at NAB. If you’ve already made up your mind and decided that you must have this lens now, head over to DuclosLenses.com and pre-order your Canon 18-80mm Compact-Servo lens today! Hey Matt, can you find out from Canon whether the image circle on this lens will cover the 4K crop mode on the 1D X Mark II? The crop is something like 1.33 I think.., you’d probably know better than me. I seem to remember that it was just a touch wider than S35, so I’m concerned that this lens might not quite cover it. The image circle is 31.4mm in diameter. Nice review Matt. There is only one negative about this – Canon have got into a habit of announcing gear, including this lens, a full six months before it will be available. According to a big european dealer, availability on this is November / December, by which time everyone will have gone off and spent their money elsewhere. I agree. The whole industry has fallen into this habit. They announce gear as quick as possible to stay ahead of the competition – even if it isn’t ready to deliver. We see the same thing from all of the major manufacturers.